My Romantic Home: Thank you! I've met some of the nicest people through my blog. Although we've never met in person I consider you my friends. Lisa from Enchanted Cove Productions sent me this beautiful set of 6 place mats and napkins. She had posted a photo of this set (which she found at a yard sale) on her blog and I left a comment about not being able to pass those up if I saw them (ya know how much I love blue) and she was so kind to split up her set of twelve and send me 6 of each! How sweet was that!!! Thank you Lisa, I love them. If you haven't been to Lisa's blog you should go visit her. She makes really, really beautiful things out of shells. Ruth, another sweet person sent me this romantic home sign which I have hanging in my entry way. Remember awhile back I did a post about her hand painted signs? After I did that post she sent me one in blue and yellow. I love it! The yellow in the flowers goes perfectly with my yellow walls. Ruth sells on eBay and she also has an online store called Classic Cottage Charm. Click on the highlighted text to visit her. Thank you Ruth, I really love it! I was happy to see all the comments yesterday about some of you also having Mother/Daughter dresses...I'm so happy I wasn't the only one that did that! Shari: I tried to reply to your email but it's not going through again. I LOVE the rug! Send me another email and I'll get back to you. I may have messed something up with this post. Is the text under the pictures showing up normally? What beautiful gifts - how lucky you are! The text is fine - and I love your style! Such a lucky lady! Just perfect for you! Lovely readers, lovely you! I am seeing the text fine! I think those are two sweet people! 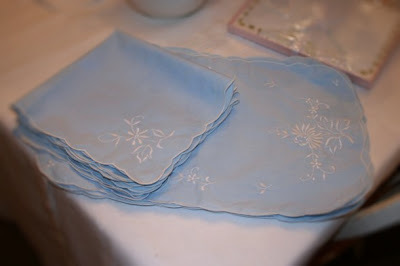 Those napkins are lovely, and just perfect for you, and Ruth is such a sweetie and very talented too! I love the blue napkins. I go to Lisa's blog all the time. I love it. She is the nicest person. 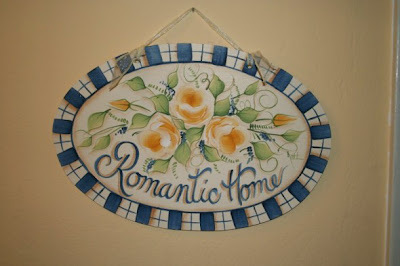 Love your Romantic Home sign too! What a beautiful gift! Just recently begain blogging and coming to you via DaisyCottage. I just love the pictures of your home, just gorgeous. Will visit again. Have a great holiday weekend! The napkins are the BEST shade of blue! Thank you for sharing the blog of the sender...I have checked it out and love her shell items - I guess because I am a mosaic artist I felt drawn to them. Thanks! Cindy you are so welcome! You were my inspiration to start blogging and I really admire your beautiful home and how you photograph everything like a magazine! I love that in "blog-land" we can encourage each other as creative women and inspire each other to be better...and really hear each other and support with our kind words and wishes! Thank YOU Cindy! Finally I can get on here...whew! Isn't Lisa the best! I not only love here site but she always leaves the sweetest comments! I think both gifts come to a very special lady from very special women! Darling both items! Blog friends are awesome, aren't they??? Lucky you to get one of Ruth's signs. I have been checking her auctions and website for quite awhile and know I just need to order. Thanks for introducing her because I think she's just a fantastic artist! I know also how many sweet people are on teh internet! I ahve met some of my internet friends..They're as nice in person! Those are both very thoughtful gifts! I know you are thrilled to have them. So happy for you.